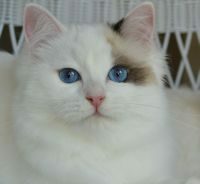 No kittens available, decision pending on the current 5 kittens. Waiting list is closed. No other pregnant females at this time. We have 2 kittens from Caramel/Jaime. 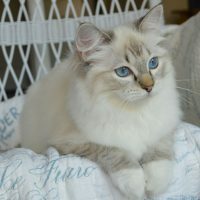 (DOB Feb 28) Seal Lynx mitted. boy and girl. On hold. 3 kittens from Twinkle/Jaime. (DOB March 1) Seal Lynx Bicolor. one girl and two boys. On hold. 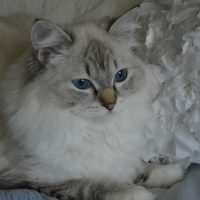 “Blue Knight” Blue mitted one year old altered boy available for adoption in May-June. $650. Blue Knight. 1 year old. Neuter. 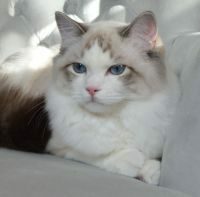 “Caramel” 2 years old spayed female available for adoption in May-June. $350. “On hold” “under evaluation” means decision pending. May or may not become available. “Pre-booked” means deposit paid, viewing pending. “Reserved” means the kitten has been chosen and deposit received. “Available” means inquiries are welcome.